It is unclear why this occurs, but may be due to a restricted blood supply during pregnancy, which leads to the death and partial absorption of one of the twins. Xiao Fei and his family come from far-flung Xinjiang in western China. His parasitic twin hadn’t been detected prior to his birth because his mother had not undergone regular pregnancy checks, said the report. After Xiao Fei was born, his family took him across China to look for treatment and they were finally admitted into the Shanghai Public Health Clinical Centre. The boy’s surgeon Chen Qiu described Xiao Fei’s condition as ‘highly complicated’. Mr Chen told Shanghai Dragon Television ahead of the operation that Xiao Fei’s middle leg would be removed because it did not have any function. 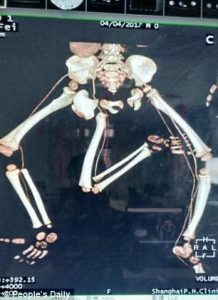 However while Xiao Fei’s right leg would be kept, it was born deformed because its foot was shaped like a hand and could not function properly. Therefore, Mr Chen said he and his team would not only remove Xiao Fei’s middle leg, but also cut off the foot on Xiao Fei’s right leg before transplanting the foot on the extra leg onto his right leg. 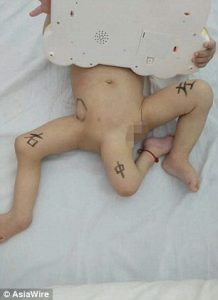 In addition to the parasitic twin, Xiao Fei was diagnosed with a series of other conditions, including an undescended testicle, abdominal hernia and congenital heart disease. These conditions increased the difficulties of the operation, said Mr Chen. 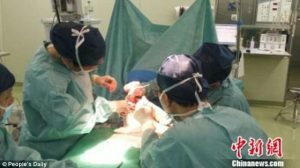 Bao Juan, the director of the Department of Urology of the hospital, said surgeons would bring Xiao Fei’s right testicle down from the abdomen to its usual place during the same operation. The operation started from 10am and finished at 7:35pm. Surgeons claimed it a success. Zhu Tongyu, the director of Shanghai Public Health Clinical Centre, said the success of the operation was significant because of the rarity of the condition. Mr Zhu also said the operation could ensure Xiao Fei to live a relative normal life, however Xiao Fei’s kneecaps are missing, so further surgery will be planned when the boy grows a bit older. 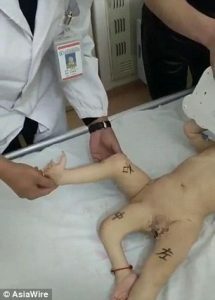 0 Response to "Chinese baby born with 3 legs undergoes 10 hour complex surgery to have extra limb removed"